I’m not sure what’s more terrifying – watching your child scream down the street on wheels at great speed hoping they’ll come to a halt safely or shopping for safety-conscious products for such an activity. Having mentioned both Nutcase and Early Rider here previously we truly believe they are great products so we’re thrilled at the release of new designs for children (and parents!) to delight in. Joining the ranks at Early Rider are two new coloured versions of the Classic Early Rider balance bike. A perfect first bike for children aged between two and five, you now have the choice of blue or pink in addition to the all natural birch variety. All come with the comfortable faux leather seat, padded handles, flame detailing (yes I think they do make it go faster) and pneumatic tyres for a superb final product. 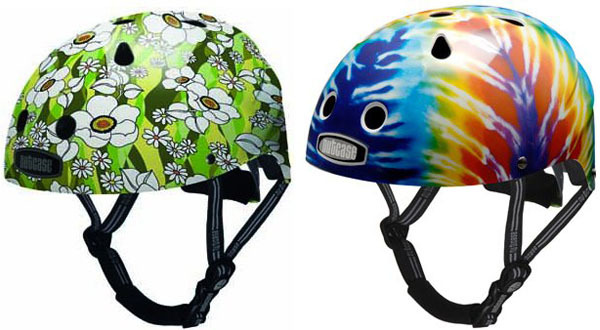 The Little Nutty helmet from Nutcase is fabulous both aesthetically and in the design itself. Little Nutty helmets fit the smallest of heads, right down to a forty-six centimetre circumference. Nutcase is continuing to makee much loved designs along with some new ones for 2010. There’s no misplacing a helmet that looks like this, it stands out in the crowd for sure! Little Nutty helmets at $99.95 and the Classic Early Rider, $279, are available from Early Rider. Delivery is available all over Australia.